Looking for the perfect modern sofa for your condo, office, or apartment? The Serta Palisades Sofa is the whole package: Supportive with incredible comfort and great style! Built around a solid hardwood frame, single base, and individual pocket coil springs, this Palisades Sofa has high-density foam cushions that you’ll love to sink into! The soft, durable upholstery comes in several colors to go with any design palette. Assemble in 30 minutes or less—no tools required!. For the price, the sofa is pretty much what you would expect. It's sturdy-ish and comfortable enough and was very easy to assemble. 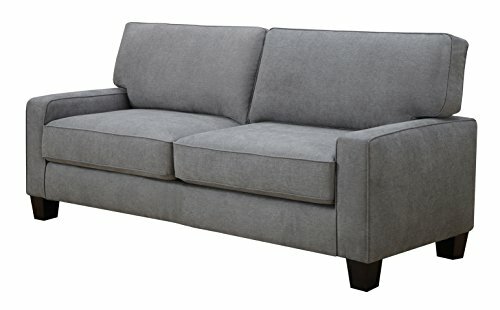 I got it with the intent that it will need to be replaced in a year or 2 by which time I should be able to afford a good sofa and the quality seems to reflect that. Overall, I am pleased with the purchase. The customer service for the manufacturer, however, IS BAD! I knew from previous reviews as well as the instructions in the box that the cushions and hardware were stored inside the bigger pieces to make shipping more compact. Once I unpacked everything, I quickly discovered that the hardware for assembly and the legs were missing. After double- and triple-checking all the pieces and the box, I called the manufacturer. At first, they insisted that I just did not see the missing pieces since everything was packed inside each other. After I pointed out that I would not have all 6 cushions and covers if I hadn't unpacked everything, they agreed to send me the missing missing thumb bolts and legs. BUT it would take 7-10 days to get them to me. I had already gotten rid of my old sofa to make room for the new one so would have no place to sit but they said there was no way to expedite shipping to me. They had no supervisor available for me to talk to and transferred me to a nameless voicemail. I called back the next day only to find out there was still no supervisor available. I called Walmart who said I could only work with the manufacturer and I called Serta directly who said a third party uses the Serta name so I had to deal with them. I called the manufacturer back to have the pieces shipped and sat on pillows on my floor for 11 days. When the package finally did arrive, I did not get the 4 thumb bolts and 4 legs as promised. Instead, I got 5 thumb bolts and 2 wingnuts. I called back to complain and, again, was told 7-10 days to get the missing legs and, again, not a single person available who could expedite these. I ended up ordering new legs off of Amazon which I got the very next day (the 5" legs seem to be the perfect height).